The Sky Rovers Flying Club (now celebrating its 50th anniversary) and incorporated in 1971, is a non- profit organization comprised of individuals who share a common interest in flying radio controlled model aircraft. Ford Field was dedicated on 9/24/78 in memory of Harold Ford, a founding member and Club benefactor. The Club promotes the growth of the hobby through public events such as Airshows, Auctions, and displays. It also advances the hobby by educating individuals in safe flight practices through mentoring, flight training, and model building activities. 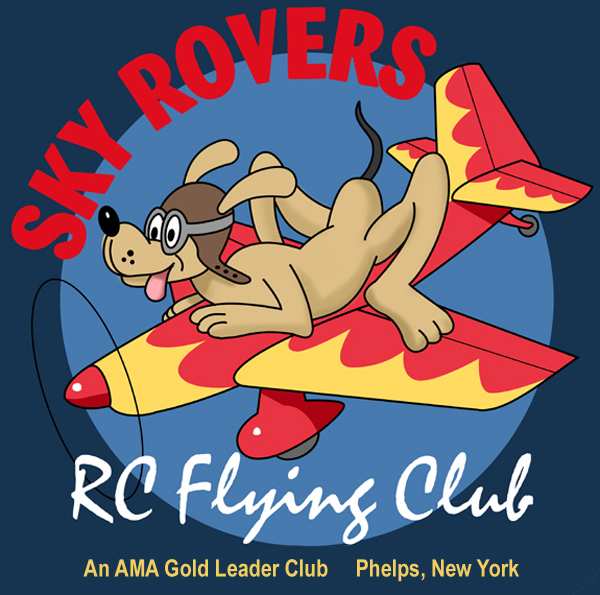 The Sky Rovers Flying Club was designated a “Gold Leader Club” by the A.M.A. (Academy of Model Aeronautics), our national organization. The Club meets on the first Thursday each month at the Phelps Community Center. It is located at 8 Banta St. in Phelps, NY. The meeting starts at 7:00 p.m.
Our Club has approximately eleven acres of property situated just north of the village of Clifton Springs. The club is unique in the area because we own our property. A grass runway, 660 feet in length, allows the use of virtually any radio controlled model aircraft. Safety is paramount, during field operation. There is a large field just south of the runway that is used for RV, tent camping, and parking during events. There are three out buildings, a sun shelter, and a covered picnic pavilion. Restroom facilities are also available. All visitors are welcome and encouraged to observe or participate in flying model aircraft. This pastoral setting has been compared to a large park by many visitors, who have been pleasantly surprised by these surroundings. It is our hope that all who visit will enjoy the grounds and fellowship they will find there. The field is open the first week of May and closed on the last weekend in October.